Background: A variety of genetic pathways have been described as being essential in drug abuse and myocardial ischemia (MI), including dopamine-2 receptor gene (DRD2) and serotonin transporter gene (SERT). However, there is insufficient information on how those genetic pathways could contribute to their comorbidity. Objectives: The study aimed to examine the potential association between drug abuse/myocardial ischemia comorbidity and five single nucleotide polymorphisms (SNPs) of DRD2 gene; Taq IA, Taq IB, Taq ID, -241A>G, and -141C del/ins, and two SNPs of SERT gene; 5-HTTLPR (rs25531) and an intronic variant (Stin2). Method: Fifteen Egyptian families including 211 individuals and 75 control subjects were genotyped using PCR-RFLP assay method. All individuals were assessed using drug use survey and complete cardiovascular profile. Results: The odds ratio (OR) for comorbidity with early onset MI associated with the A1A1 genotype of TaqIA was 3.9 (95% CI=1.8-8.5). However, B1B1 and B1B2 genotypes of TaqIB were significant in comorbidity of early onset drug abuse phenotype (OR =2.6, 95% CI=1.4-5.2 and OR=1.7 and 95% CI=1.2-2.5 respectively). Genotype AG of - 241A˃G showed higher risk among comorbid subjects of early onset drug abuse (OR=1.9, 95% CI=1.4-2.7) and ins-containing genotypes of -141C del/ins were significant in comorbidity. Regarding SERT gene, SLA genotype of 5-HTTLPR and 10/10 of STin2 were significantly associated with comorbidity of early onset MI with OR=1.5, 95% CI=1.1-2.2 and OR=3.3, 95% CI=1.5-6.9. Conclusion: SNPs of the studied genes have made a significant contribution to comorbidity however, further studies are needed to validate the results in a wider population. 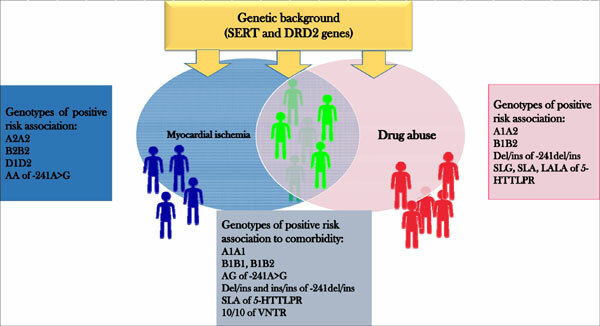 Comorbidity, gene polymorphism, drug abuse, myocardial ischemia, DRD2, SERT, SNPs.